Better meats by sacrificing instead of slaughtering. There’s a difference! 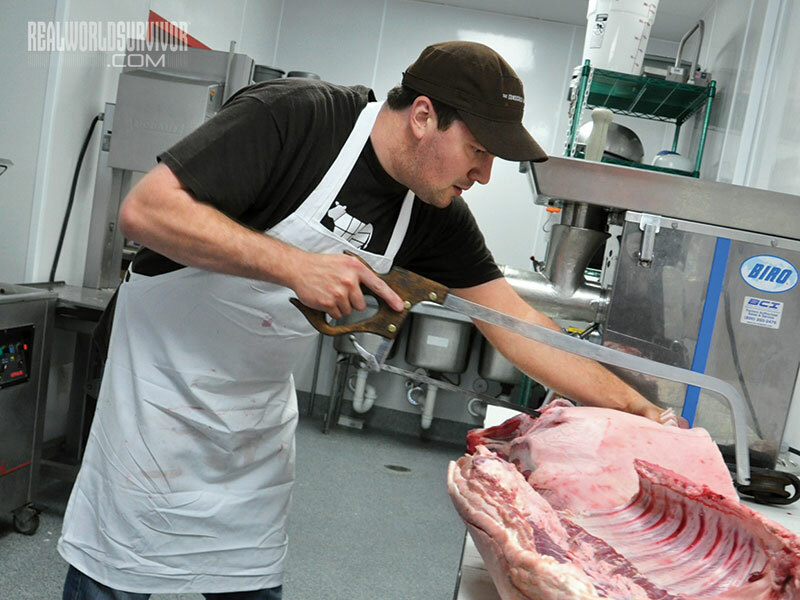 Durand looks on as Dave Gathy works on half of a hog. Until he saw how well the animals were treated at Otter Creek, Durand was a vegetarian. 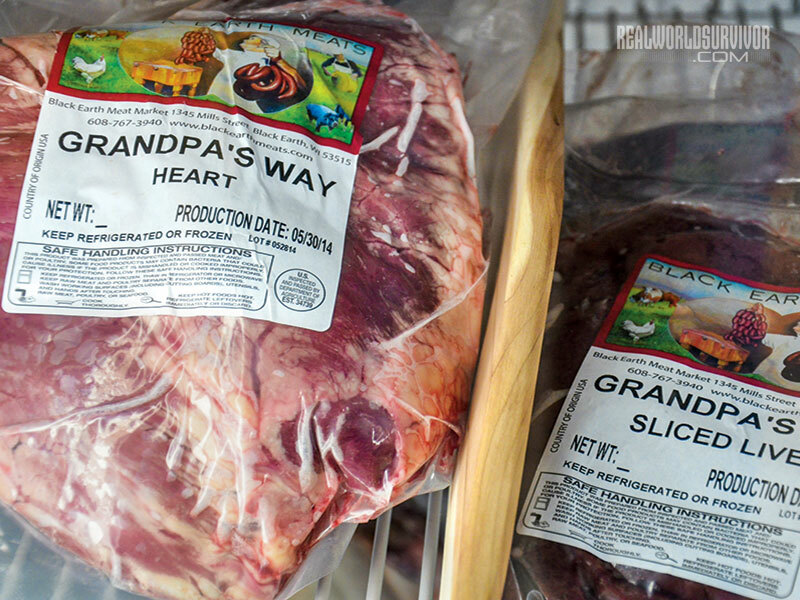 Packages of “Grandpa’s Way” grass-fed beef in a locker are ready for sale. Durand uses meat raised by Otter Creek and other small, local farms. Fresh steaks ready to sell at the Conscious Carnivore. 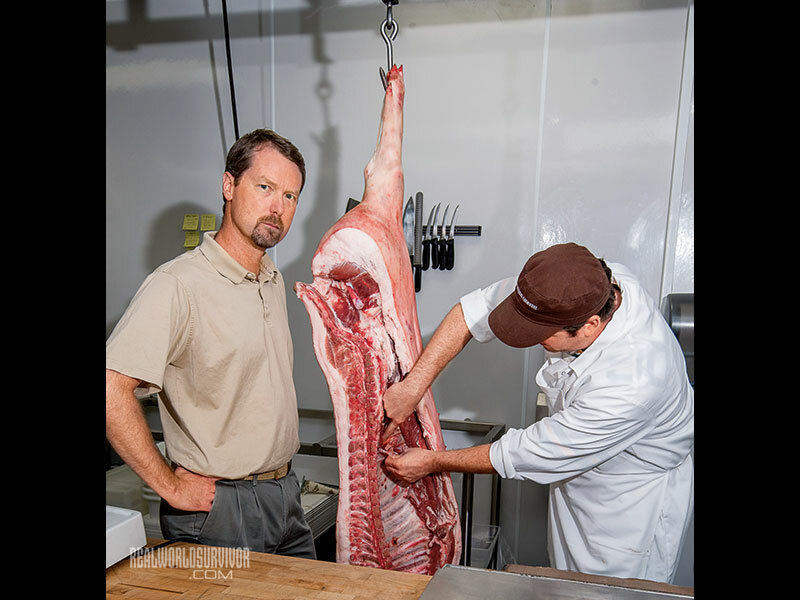 Meat is hung 7-12 days to improve flavor and tenderness and to allow water weight to evaporate. On the killing floor of the certified-organic, USDA-inspected and Animal Welfare-approved facility in rural Black Earth, Wisconsin, a sign read, “We honor these animals, for by their death we gain life.” Well said! That kind of mentality, of killing the animals as humanely as possible by offering them fresh water and moving them slowly through the facility, not only kept the animals calm and relaxed, it protected the psychological well being of his employees, Bartlett Durand explained. 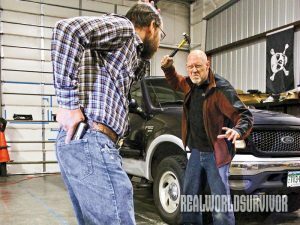 He worked with his slaughter crew to change the mentality from “killing” to “sacrifice,” putting emphasis not only on humane handling practices and stunning techniques, but on the spiritual connection between the crew and the animal—and eventually the consumer. 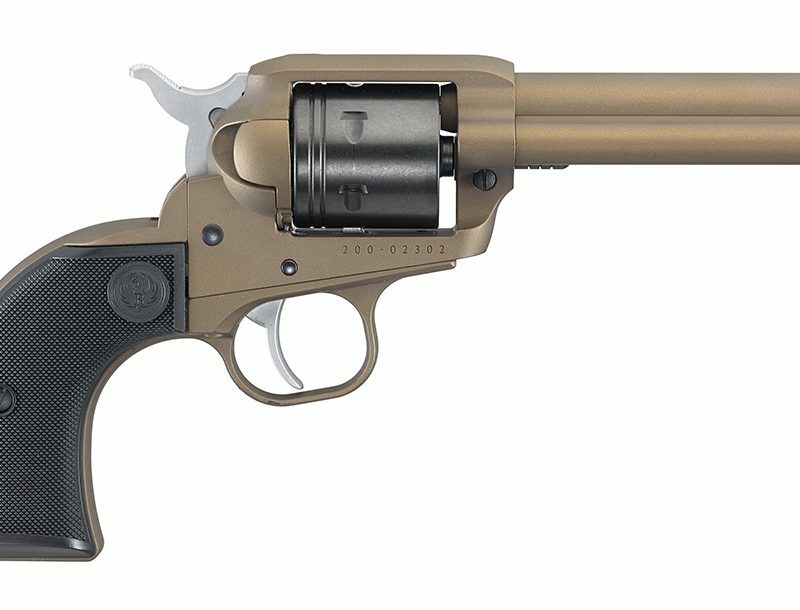 And there is a practical side as well to humane handling, as it also ensures a better product. Better Quality: Animals that experience stress in the processing facility release hormones that burn through fat, resulting in tougher, more gristly meat. By keeping the animals calm up until the moment they’re killed, “you get a higher-quality meat,” Durand said. The slaughterhouse is something a lot of people don’t like to think about, but it’s the missing piece between rural and urban, between the farmer and the consumer. 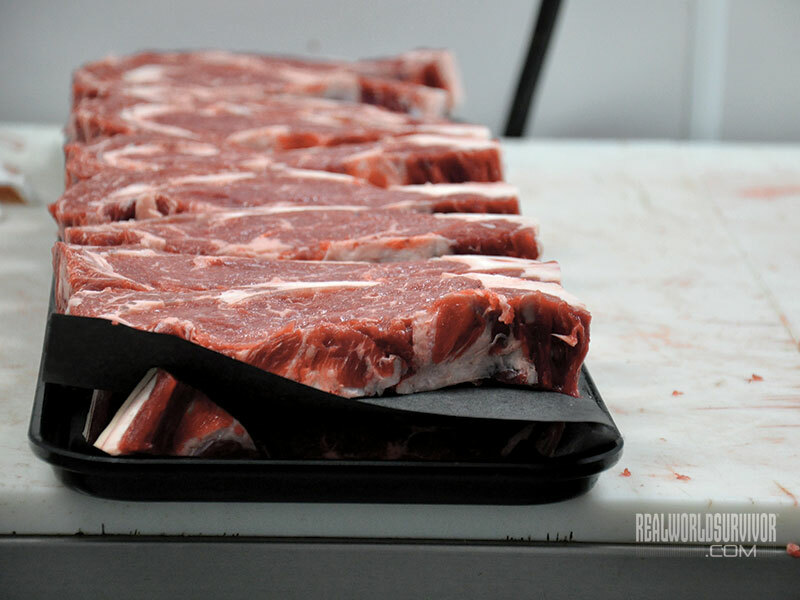 More people want local, grass-fed beef than ever, but Durand said they don’t think about how the meat is processed. 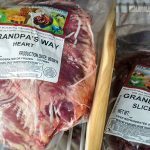 A lot of times meat may be raised locally, but then it’s sent to a mass-processing facility before arriving at your plate, which for people concerned about quality and local food systems is like “sending your mother’s hand-pattied burger to McDonald’s first before you feed your family,” he said. Big vs Small: Big processing centers run animals through like they’re widgets on an assembly line, processing up to as many as 5,000 animals a day. 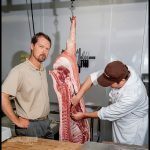 Smaller farms have difficulty even finding processing centers that will take their few animals, which was why Black Earth Meats went out of its way to connect with small farmers. It processed about 150 animals a week at its facility—mostly cattle and pigs. “We worked hard to get to that level of efficiency,” Durand said. 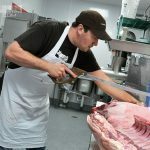 Master butchers handled one animal at a time, making the best cuts and hanging the animals for seven to 12 days to produce better tenderness, flavor and to allow water weight to evaporate. 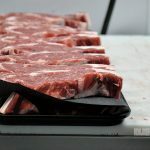 In large slaughterhouses meat is cut and shipped in a matter of hours, partly because it is more efficient, Durand said, and partly because meat is priced by the pound. 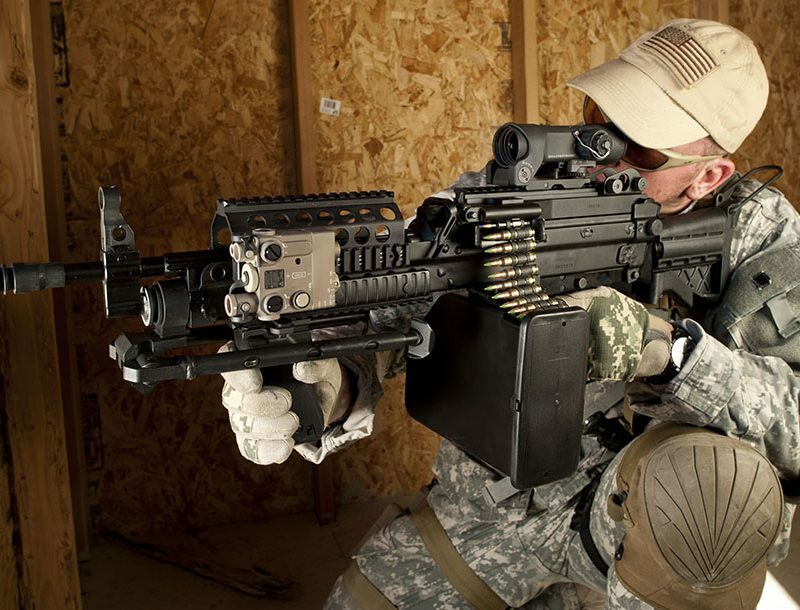 Back-pocket carry allows you to access your gun in any situation!